← The Sports Archives – The Equine Industry And Its Impact On The Economy! The Sports Archives – How To Do The Butterfly Stroke Beautifully And Elegantly! 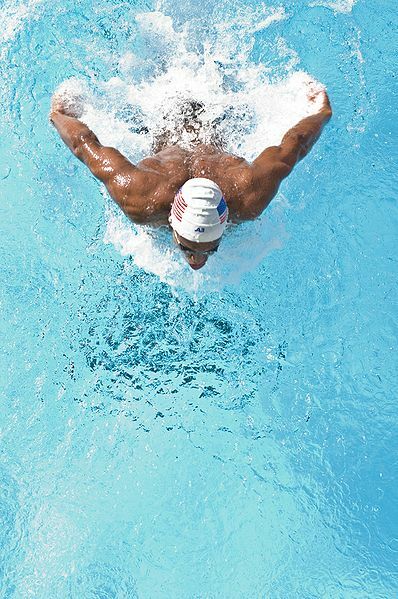 If you want to be involved in competitive swimming, you must learn how to do the butterfly stroke. Furthermore, you want to be able to do it very quickly. Naturally, you cannot learn to swim without actually swimming, but hopefully reading the guidelines below will help you to perfect your stroke at least somewhat. Learn the butterfly stroke last. You have to have a very strong body and your stamina and endurance needs to be very high. You should have built this up through your other training. Get an instructor. You can learn to do the butterfly yourself, but it is a whole lot better to have someone who knows how the stroke goes watching you and giving you hints and tips on how it actually works. Work on the kick first. The butterfly kick is the most important part of the entire stroke. You have to keep your legs together and move in the way you would imagine a mermaid to move. Basically, the movement is like a fluid wave. Most people find it easiest to learn this by wearing flippers, which can work. Do not, under any circumstances, use a kickboard. This will force your body in the wrong shape. The kick is in two parts as well. The first is medium in size, when your hands go in the water, and the second is a larger one, which happens when you have to lift your body up. Get the arms right. As soon as your head comes out through the surface, your hands need to move forward. Take a breath and then tuck in your chin, touching the top part of your chest. This way, your arms will get much higher. You need to make a round, swooping movement, starting at the back and bringing your arms together in front of your face. It is best described as a keyhole shape that you do continuously. Following these steps, turning them into a whole movement that you repeat over and over again should allow you to do the butterfly stroke perfectly. Try not to splash too much. If you do, then you’re not getting the movement exactly right. Some swimmers also choose to do two revolutions of the arms before going up for a breath, which does increase speed but can reduce endurance, so that is up to you. One thing to remember as well is that if you do the butterfly in a competition, you must touch the wall with both your hands before turning around and going back. If you do not do this, you will actually be disqualified from the race. Actually taking part in races, however, is something you should not do until you have truly mastered the stroke, which may take a long time. In fact, many competitive swimmers never compete on the butterfly, simply because it is such a hard and tiring stroke. If you are one of the lucky few who can get over this, you may just go really far in swimming. Chloe Adams is a keen swimmer. Her two children also love to swim with www.puddleducks.com. Effective Ways To Improve Your Swimming Technique And Form! This entry was posted in Other and tagged butterfly kick, butterfly stroke, butterfly stroke competitions, butterfly stroke learning, how to do the butterfly, sports and recreation, sports and training, Sports Archives, Sports Blogs, Swimming, swimming archives, swimming blogs, swimming performance, swimming tips. Bookmark the permalink.